TIFFIN — Heidelberg University volleyball player Taylor Valentine, a sophomore, has been named the Ohio Athletic Conference (OAC) Player of the Week. Valentine is the daughter of Galion head volleyball coach Jaime Valentine and boys head basketball coach Matt Valentine. Valentine led Heidelberg to a perfect 3-0 record this week, including key conference sweeps over Baldwin Wallace and Marietta. 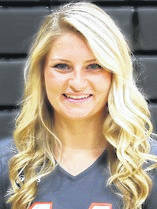 The sophomore tallied 33 total kills and 37 digs over the three matches. Her biggest match came against Baldwin Wallace on Tuesday. In the contest, Taylor recorded 12 kills on offense, 12 digs on the defensive side of the net and also added three aces in her service attempts.